PRICE VERSUS VALUE « THE BRYCE IS RIGHT! « HOW MUCH DO WE REALLY USE OUR HEAD? 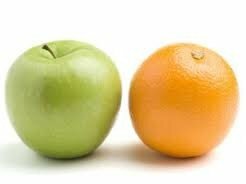 – Are we really comparing apples to apples, or apples to oranges? In business, there seems to be a growing change in the perspective regarding purchasing. I am finding more and more people attracted to vendors who simply offer the lowest price. This is fine if you are genuinely comparing apples to apples, but not apples to oranges. Price is one thing, “value” is something else, and something people commonly overlook these days. By “value” I’m including the services above and beyond the cost of the product. For example, warranty and maintenance. Long ago automotive companies realized cars were not sold by price comparison alone, but by the accompanying services, such as roadside assistance, waiving of finance charges, extended warranty on the power-train and body, etc. Adding such service is a testament to the confidence you have in your product. If you have a good quality product, you have little to worry about. Not long ago, I selected a new cable provider for home, something it seems I do every three years now. I believe I have tried all of the providers in my area. On the surface, one looks better than another and are priced competitively. I suspect most people make their purchase decisions by price alone, but having used all of them I consider the overall value of each provider which is not just the specifications of the service but its reliability. Living in the lightning capital of America, I realize all providers will take an electrical surge from time to time, but I want a service that rarely goes down and has the fastest response to correcting problems. That’s “value.” I may have to pay a little more for it, but I will gladly do so to keep my televisions, telephones and computers up and running. I generally gravitate towards the vendor who offers the best value, but this is a trend that seems to be changing in the business world. Here in the Tampa Bay area, a local distributor of manufacturing related accessories is experiencing a decline in their market share due to this cost vs. value phenomenon. For years, the distributor offered a wide variety of products at competitive prices. More importantly, they offered value to their clients by freely maintaining their inventory, auditing product consumption, and other miscellaneous services, all of which saved their clients considerable money. They also offered generous terms for payment. Unfortunately though, they are losing out to other vendors based on simple price comparisons. It seems the new purchasing people want to make a name for themselves by selecting the low-ball bid thereby seemingly saving money for the company. However, by overlooking value they are ultimately costing their companies more money in the long run. Some companies have the gall to ask the distributor to continue to freely maintain the inventory and do the audit. No, I’m afraid that ship has sailed. Only then do they realize the meaning of “value,” but it’s too late. A vital business relationship has been shattered. It’s okay to take the low-ball approach when you are matching products purely of the same kind, but don’t be foolish and overlook the value of products where there may be long-term benefits to be considered. In other words, don’t try to match apples with oranges. It doesn’t work. LAST TIME: HOW MUCH DO WE REALLY USE OUR HEAD? – Not as much as you may think. This entry was posted on August 26, 2013 at 6:00 am	and is filed under Business. Tagged: Florida, palm harbor, PRICE VERSUS VALUE, The Bryce is Right, tim bryce. You can follow any responses to this entry through the RSS 2.0 feed. You can leave a response, or trackback from your own site. “And, of course, our own government prizes “lowest cost, technically ACCEPTABLE” as a philosophy in deciding contracts (at least that’s what they say). Even when they say cost is not the primary driver, it ends up being the primary consideration. Here, here !!!! Couldn’t be more right. “I’ll lay odds every geezer in here knows exactly what you’re talking about. But the younger generations are quite happy to replace rather than repair. Despite trying to teach our children not to be part of the throwaway generation, at least one of them seems determined to operate that way.